Set in London during World War II, renowned choreographer Matthew Bourne reinterprets this classic fairy tale as a war-time romance. A chance meeting results in a magical night for Cinderella and a dashing young pilot, together just long enough to fall in love before being parted by the horrors of the Blitz. A thrilling and evocative love story featuring sumptuous designs by Olivier Award-winning Lez Brotherston designs and lighting by Olivier Award-winning Neil Austin, this dazzling production of Cinderella takes you into the heart of Prokofiev's magnificent score, and the sights and sounds of war-torn London at the Ahmanson. "...Twenty years ago a live orchestra accompanied Bourne's "Cinderella." But realities now bring us canned Prokofiev ornamented with realistic sound effects (air-raid sirens, for example), used discreetly, for the most part. Bourne includes more of the score than many of his predecessors (among them Frederick Ashton) and the result balances the documentary, romantic, narrative and comic components of his vision in an entirely original way." "...To be clear, because it's presented by New Adventures, which is supported by public funds from the Arts Council England, and Center Theatre Group, a preeminent arts and cultural organization in Los Angeles, we expected an ambitious production and top-notch performances. Playing with the storyline is fine, but Nazis and Cinderella don't really groove well together. This isn't The Sound of Music. And there are good films out there that provide a different spin on the Cinderella story - Drew Barrymore's Ever After is one - so revamping it for dance didn't have to be disappointing. Bourne's Cinderella needn't have gone full cartoon fantasy to entice, but a little less war and a little more joy and magic would have gone a long way." "...Even with all this thoughtfulness, the achingly beautiful music, and the pointed narrative, the peak of the story comes at "this is the real me" moment, when Harry and Cinderella reveal their unglamorous selves to each other. They're probably contentedly together in old age today, recalling the Blitz and how they met." "...New Adventure's Production of the tale of Cinderella has never been more salacious or delicious. The dancing is superb, as well as the artistry involved in every facet of the production. With the updated scenario created, Cindy's world is smack dab in the middle of World War II. Directed and Choreographed by the incredible Sir Matthew Bourne, and loosely based on his parent's war stories, we are taken to London in the '40s, during the middle of air raids, bombings and destruction. The set design and wardrobe is all very drab in muted black and grey reflecting the tone of the environment." "...There is some neat choreography - particularly in the second of three acts - the willowy Ashley Shaw is always a delight to watch as Cinderella, and Neil Austin's fiery lighting is clearly influenced by the Technicolor palettes of such 40s directors as Michael Powell and Emeric Pressburger and Vincente Minnelli. But instead of swing music, which might have been appropriate if a bit of a tired cliche, it is all danced to the sometimes swirling, sometimes languorous waltzes of the original 1945 Prokofiev score, played by a prerecorded 60-piece orchestra. So, depending on where you stand, it all adds up to either art with a capital "A" or kitsch with a capital "K." You get what you came for." "...The final sequence at Paddington Station owes some debt to David Lean's classic, Brief Encounter. Gene Kelly and other cinematic influences can be seen in most of Bourne's works, but his true genius lies in marrying the visual splendor and scope of cinema with crowd-pleasing choreography to arrive at his own form of ballet. By most measures, such a collision ought to turn up a pandering mess designed to please and not provoke. But that isn't the case. Bourne's ballet is an accessible amalgam that challenges and pleases the senses and will sweep even dance aesthetes off their feet." 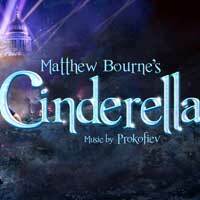 "...Matthew Bourne's CINDERELLA is at turns glorious and at turns poignant. Lez Brotherston's costumes remain black and gray, much like an old film from the era. Only the new and improved Cinderella and her guardian angel manage to break the mold in shining white. Lez Brotherston is also credited with the set - and it is a fascinating set - most especially in the Cafe de Paris segment in Act II. Directed and choreographed by Matthew Bourne, CINDERELLA makes excellent use of Duncan McLean's projection, Paul Groothuis' sound, and Neil Austin's lighting. In an earlier interview, Bourne indicated that several films of the time inspired the direction he took in this fable, including "A Matter of Life and Death" (1946), "Brief Encounter" (1945),"Waterloo Bridge" (1940), and "The Bishop's Wife" (1947). It was riveting to note that the famous bombing of the legendary Cafe de Paris actually took place on March 8, 1941, killing or seriously injuring nearly 100 dancing couples." "...The world's favorite step-daughter once again meets her Prince Charming (but this time the man in question is an injured WWII pilot, the setting is London circa The Blitz, and their romantic tale-as-old-as-time is told entirely in dance as only Sir Matthew Bourne can choreograph it) in the thrillingly performed, apty retitled Matthew Bourne's Cinderella (Music By Prokoviev), now paying a return visit to the Ahmanson Theatre twenty years after it first captivated L.A."
"...Celebrated director/choreographer Matthew Bourne had dedicated his latest outstanding production of CINDERELLA, set in London during World War II, to his "Dad, Jim Bourne (1932-2010) who was there and lived to tell the tale." His magical interpretation of the classic fairy tale has, at its heart, a true war-time romance beginning with a chance meeting between Cinderella and her dashing young RAF pilot, together just long enough to fall in love before being parted by the horrors of the Blitz, just in time for Valentine's Day celebrations." "...Don't miss Matthew Bourne's Cinderella at the Ahmanson through March 10! Bourne's genius is present every second and you won't be disappointed. Although darker than other versions of Cinderella, Bourne's does project optimism snd some happiness within a bleak world." "...The only words spoken are in the newsreels, the rest of the story is all told through movement. You can almost feel the audience grapple with this. You can certainly hear them talk about it during the two intermissions. Eavesdropping you'll hear variations of: "gosh I thought they'd talk or sing" and my favorite pas de deux: "I'm not sure it's really theater" and "I'm not sure it's really ballet."" "...Hats off to principal dancers Cordelia Braithwaite (Cinderella), Andrew Monaghan (Harry), Paris Fitzgerald (The Angel) and Anjali Mehra (Sybil, the stepmother). As plots go, this one thickens by the minute and is difficult to follow, if you're seeking to match it to the fairy tale. However, it does have a happy ending." "...This production combines contemporary dance with classic ballet, all set to music by Prokofiev, which was pre-recorded by a 60-piece orchestra and plays in surround sound (designed by Paul Groothius). The design elements are lush and extravagant. Lez Brotherston's sets help the action transition seamlessly from Cinderella's home, to the ball, to the warn-torn streets of London, to the hospital and beyond, creating a world that feels as expansive as a proper fairy tale requires. The actors do not speak or sing, expressing themselves only via dance and movement, but even the parts of the story that are a departure from the most well-known version are perfectly clear and effective."